Dessert is a topic we cover less often than breakfast or entrées (even if we are having dessert for breakfast - what a fantastic idea!). And it’s just not fair. Bread has earned its place on the dessert tray, and we at Grace Baking intend to give our Tuscan Boule the sweet-tooth recognition it so rightly deserves. 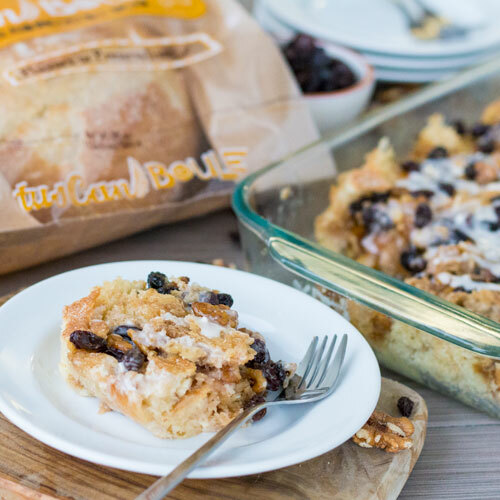 As the key ingredient in this easy-to- make, even-easier-to-devour Rum Raisin Bread Pudding it manages to give an unexpectedly delicious twist to an old favorite. Doubly true when considering this golden brown, drizzly, drippy rum-icing-covered recipe is perfect for serving anywhere & anytime over the holidays. We’re sure that you’ll want to study its effects on friends, family and causal passer’s-by you’d like to impress. Enjoy! In a medium skillet over medium heat, melt butter. Stir in brown sugar and ¼ cup of cream, and mix until sugar is dissolved. Add in raisins and walnuts, and cook for an additional 2 minutes. In a mixing bowl, combine remaining cream, buttermilk, rum extract and eggs. Whisk until thoroughly combined. Spray a 9-by-13-inch baking dish with nonstick spray. Arrange half the bread cubes in the pan, and cover evenly with half the cream mixture and half the raisin mixture. Repeat process with remaining bread, cream mixture and raisin mixture. Cover pan with foil and refrigerate for an hour. Preheat oven to 375ºF. Once oven is ready, remove bread pudding from refrigerator and bake, covered, for 15 minutes. Remove foil from pan and continue baking until golden brown and set (approximately 15 minutes). Make the rum icing. In a small bowl, whisk together powdered sugar, heavy cream and rum extract until smooth. Top the bread pudding with desired amount of icing and enjoy!